That annual Apple(s aapl) rite is almost upon us: The introduction of the next generation of iPhone. This year rumors have it we’ll see not one but two new iPhones introduced Sept. 10, but that’s probably got a lot of you wondering how you can cash in your current Apple smartphone or any older models you might have lying around. Well, there is some art to timing the sale of an iPhone, and unfortunately, the ideal time to cash in was last month, according to NextWorth, a company that will buy used iPhones based on its current market value. And with the clock ticking on the next generation iPhone’s official release, that price is rapidly dropping. All phones generally lose more resale value the longer you are from their release dates, but the iPhone manages to retain its high price tag far longer. For instance, for a 16-GB iPhone 4S in good condition, NextWorth will pay you $170 to $210 depending on the carrier you bought it from. For a Samsung Galaxy S III (which was released seven months later than the 4S), NextWorth will pay between $96 to $185. While iPhone selling prices tend to decline only gradually throughout the year, in the six-week period around a new iPhone launch they suddenly start nose-diving, according to NextWorth CMO Jeff Trachsel. In general, older models tend to lose 15 to 20 percent of their value in that short period, Trachsel said. 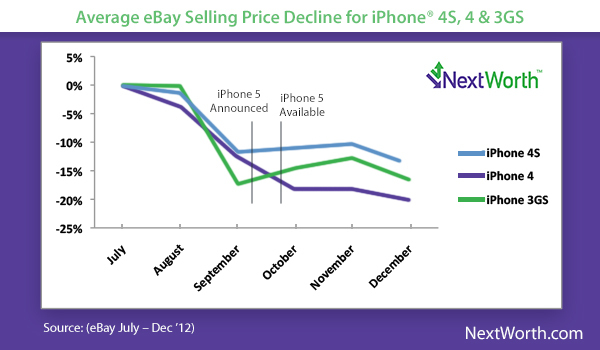 NextWorth produced a chart of average eBay(s ebay) selling prices for all of the various iPhone models from July to December of 2012. As you can see, selling prices plummeted in August before the iPhone 5’s launch in September. The then-current-generation 4S retained more of its value, and its price leveled off between the iPhone 5’s announcement and subsequent availability date. Over that same period the 3GS took a huge dip, then recovered somewhat. Meanwhile the iPhone 4 never stopped its downward price spiral, losing 20 percent of its value in five months. So where does that leave you and your trusty Apple companion? Well, if you have a device you can part with immediately, there’s no better time than now to sell it. The longer you wait, the more new iPhone hype will build and the more old devices go on sale, whittling away at your iPhone’s value. If, however, you are using your phone still and plan to buy one of the new iPhones this fall, your options are a bit more limited. Companies like NextWorth and Gazelle allow you to lock in a quote for an extended period, giving you about a month to get your phone to their warehouse (they’ve also been known to extend that grace period longer ahead of iPhone launches). So if you want to guess when Apple will make the new iPhone 5S or 5C (or whatever it or they happen to be called) will go on sale in late September or early October, you might be able time your phone sale to the day you buy your new device. If Apple let me upgrade to the new phone using the brand new 3GS I have then I will happily buy one of the soon to be released models. Go phoneless for six weeks to save $40. You will do far better selling it on Craiglist than any of these ripoff services. Exactly. I sold my iPhone 4S (64GB, Factory unlocked) for $480 on CL, about 2 months after the iPhone 5 was released. Meaning I got half of what I paid for the phone.